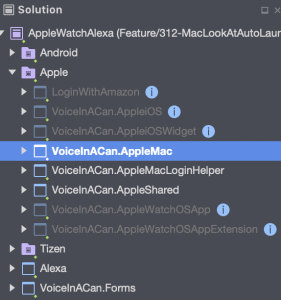 I have an app, called Voice in a Can, which lets you use Alexa on your Apple Watch and iPhone. I’m working on bringing it to the Mac, and one of the things I want is that it be started at login, if the user wants this. To do this in a sandboxed app, you need to create a helper app, and bundle it inside your main app, in a specific location (/Contents/Library/LoginItems). This helper app is automatically launched at startup, and has no UI – all it does is launch the main app, which in my case sits as an icon in the system toolbar. There is a great blog post on how to do this by Artur Shamsutdinov, which this post is based on. This blog post adds some detail, information on how to use MSBuild, and trouble-shooting information. You really should check out Artur’s post too. I made sure this was signed, and configured to use the SandBox. In a real app you’ll not want to auto-launch a Sandboxed app without permission from the user since your app will be rejected by App Review when you submit it. This ensures that the helper app is built before my main app. So far I’ve created two apps: the main app, which provides my main functionality (in my case Alexa), and a helper app which has no functionality other than to launch the main app. In order for the SMLoginItemSetEnabled to work the helper app needs to be embeded within the main app. Finally copy your main app’s bundle to the Application folder, and run it so that it registers the embedded helper to start on login. I then re-ran my main app, which re-registered my helper app as a single entry in lsregister and joy, my app launches at startup. I started working on this yesterday at 7:30 am and got it working around 1:30 pm. I’m hoping if you need to do something similar this post will shave a little time off your experience! There is no way I’d have got this working without Artur Shamsutdinov’s blog post from 2016. 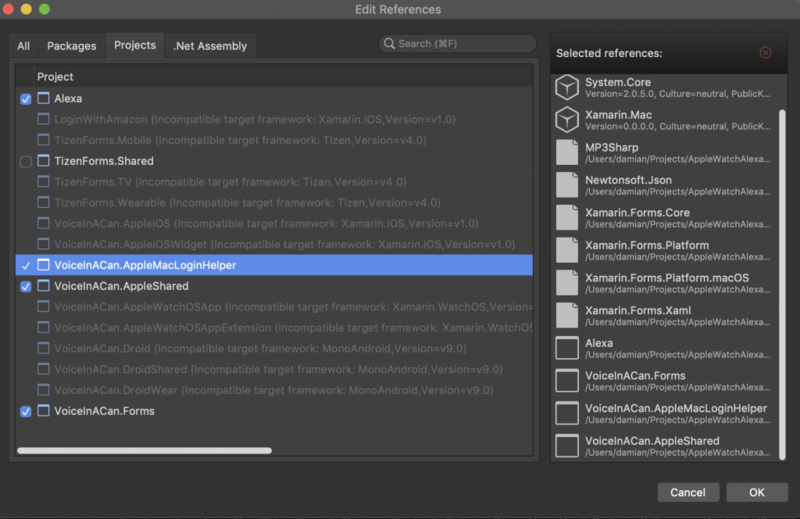 This entry was posted in Alexa, Xamarin on October 20, 2018 by damian.